Sprouting bulbs in a pot: ruddy and greenish and smelling of earth and growth, and a label that entices with the promise of Delft Blue, evokes the headier smell of hyacinths in bloom. The last of January's small stones. The department store's hectic air does not support life. If we all became trapped in here we'd soon be dead. I'm a bit less deaf today, I think, but not much. I discovered something about hearing which I expect is awfully elementary and obvious, but was a new thought for me. I can't normally do any kind of mental work, as many people do, with music playing. Not even very quietly. Not even very minimalist stuff. Not even the most twiddly, repetitive baroque. I wish I could - I expect it would make boring work less deadly and soothe my mood. I find it way too distracting. While I'm a bit deaf, though, I can - since I can hear the music less well, it distracts me less. This is clearly not just a question of volume or in the normal way of things simply turning it down would solve the problem, and it doesn't. I have poor eyesight and good hearing. My conscious apprehension of the world is overwhelmingly visual and I'm very much aware that seeing things blurred and only seeing them in any detail close up is absolutely integral to my taste, perceptions and aesthetic, and indeed to my whole personality. I'm much less aware of the significance of hearing. I've always listened to music a lot, loving it deeply and emotionally, but in a broad and pretty ignorant way. I have almost no natural sense of pitch, little fine discrimination and a poor auditory memory. But still, acute hearing is a gift and I suppose I rely on it much more than I realise. It's just dawned on me that it's not only a matter of high sensitivity to volume and being able to distinguish very quiet sounds. It's obviously much more, a comparatively high sensitivity to frequencies, tones and subtleties that enter me on all sorts of levels. If I can work to music only when my hearing is diminished, there must be a whole range of effects I'm not getting in the way I usually do. Perhaps I'll try to be more appreciative in future. Perhaps, too, I'll do something to amend my ignorance of the subject and what people have written about it from both scientific and subjective viewpoints. Meanwhile, I've had a long copyediting job to finish today, and just for once been able to play music while I did it.
" I saw this woman taking photos of bits of dead leaf or something on the ground... No, much older than you, Mum... Yeah, weird." So I have a completely blocked, deaf ear again, after an ear infection. It's an odd, disorienting, disconcerting feeling. The office phone rings and I pick it up reluctantly, hold it awkwardly to my left ear, the one I never use for this. And on the phone I hear the once familiar voice of a former colleague whom I haven't seen or heard for a decade and more. The fantasy passes through my mind that he's been here, that all that former social, working world I thought I left behind has still been right here all these years, been speaking all along into my other ear, the one I never listen with. The familiar tree tilts, as the world tilts sometimes, reveals the doggy snout and dangling foreleg of its hidden creature. 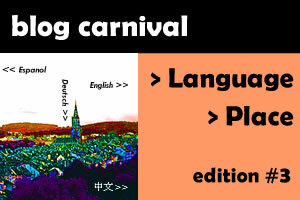 Edition 3 of the >Language >Place blog carnival has been published at Michael J Solender's blog, not from here, are you? The suggested theme was 'a place where I felt I really belonged' and some vastly varied and deeply felt contributions resulted. I love this project, and the next one will be hosted here - about which more shortly. Please go and have a browse around the new edition. It starts in the pit of the stomach and wells up in the throat, branches to grasp and echo in the back teeth on both sides, closely cups the head and comes pinching and pulling together at the crown. A forceps birth: I name her anxiety. This bus moves so slowly. It's stopping, surely, going to rock itself down, down into the ground instead of inching forward? Like my mind. Ahead of me is a tall young woman in a dark, shaggy coat and unseasonable white cotton trousers. Her thin, fast-moving legs twinkle, white lines in the grey light, hup-two, hup-two, compelling the eye as she recedes into the distance. We are the same; we are identical. 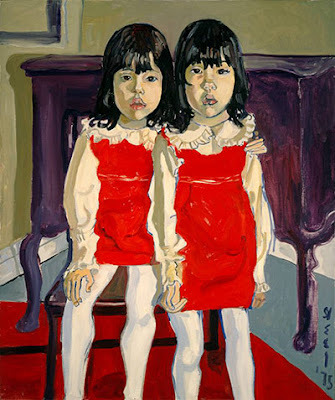 our portrait is being painted by Alice Neel. So begins a poem that Jackie Kay wrote after attending the exhibition of Alice Neel's paintings in London last year - one of many quite magical poems in her new collection, Fiere. A stone for the river. Me? she says. No, she says. Ha! Her stiff black hair flicks back and forth with every word. On Clapham Common at dusk: just above our heads, the spreading trees hold up the heavy purple sky with their bare arms - without them it would fall. The wooden screens and paper garlands evoke distant, spicier places. The reflected skyline too seems not from here. Ten buses, one behind the other, each identical in form, swaying slowly forward in identical motion, each seething with people like parasites in a swollen body. They loom for a moment, weird and alienating giant creatures, then blend back into the shimmering weave of normality.
" The more rules a society has, the more deviant characters it produces, and the same goes for cows. The grids and turntables of the modern [milking] sheds necessitated the cows walking through in the same order each time, and some were unable to get used to this, even after weeks of training. The cow that would not tow the line was the same cow who used to scratch itself on the gate, or lick the farmer's trouser leg. The farmer would give the beast a smack on the horns to push it away, half-chastising, half-affectionate. Now I heard formers referring to them as useless cattle and they had them put down. " From An Island in Time: the biography of a village by Geert Mak. A frail play of dappled light comes blinking through a crack in grey skies that seemed impermeable. Radiating colour and oozing succulence, the carrots, framed in their wooden box, are like a still life painting and give as much pleasure. Sloshing and chugging and shoulder to shoulder, chock-a-block, eyeless. 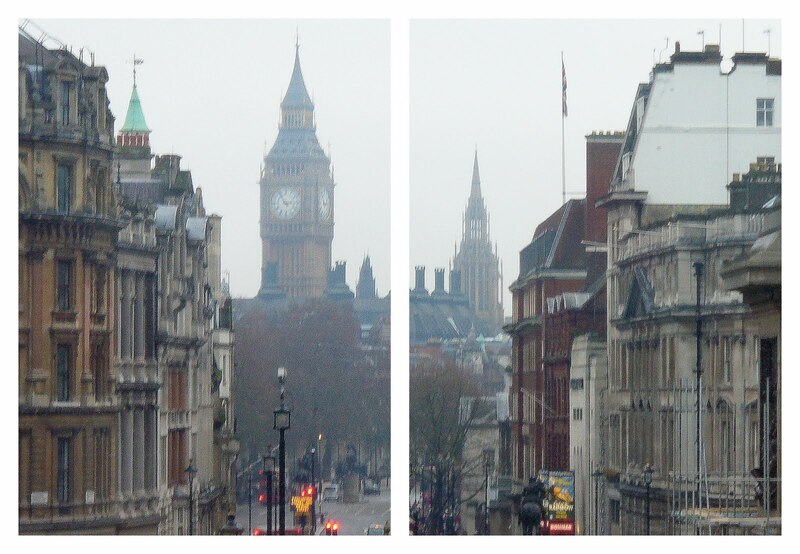 There is no light, not even in the puddles, which today are dirty and opaque and harbour no reflections. I'm re-posting one of the first things I wrote on my first blog in the Spring of 2005, as my submission to the next >Language >Place blog carnival. This will be hosted by Michael J Solender at his blog, not from here, are you? and has the suggested theme of 'a place where I felt I really belonged', though pieces on the wider theme of place and language will also be welcome. The deadline for contributions to this third edition is Thursday 20 January - instructions here. I first thought of rewriting this to make it less simple, more subtle, perhaps. Then I started reading Geert Mak's lovely book, An Island in Time, about a Dutch village and the end of agricultural village life in Europe. I thought, mine will be the last generation to remember this - even a single, isolated experience of it - the peasant life, milking a few cows by hand in a mucky cowshed on the ground floor of a small house, with the family living above. Let this memory stand as I remembered it from the mid 1970s and wrote it some thirty years later. How can the city-dweller have any relationship with cows that isn’t contrived and self-conscious? Well, I remember… I remember resting my head on the warm flank of a cow I was milking, and feeling (oh dear, how do I put this without being ultra-twee?) calm and contented in the midst of all the fears that assailed my twenty-one-year-old life - growing estrangement from my family, dread of academic failure, a difficult love, what to do with my life. I remember this and smile at myself and set myself up for ridicule, but it’s such a lovely memory. It was the Easter holiday before my university finals. I visited friends in France, where I’d spent my language student’s ‘year abroad’ the previous year, went with them to Jean-Marie’s parents’ village in the Ardèche. A golden place of old stones and sunbaked mud and buzzards wheeling in wide skies. A tiny place, a few tumbledown houses around a square. A lost place, poor and crumbling, almost all the paysans gone to work in factories, only the feckless and the none-too-bright not rushing off to better themselves. Just the one house was still inhabited in the traditional way by family upstairs and cows below. A beaming, sleazy family, still working their land, tending their few vines, milking their two cows, scratching a poor living and I fear too often passing out under the apple trees drunk on their homemade wine and spirits. Not a romantic decay. Growing poverty. Premature ageing. Fear of the authorities – all too aware that the two little grubby sparrow daughters were seen as deprived and potentially at risk. Alcoholism is alcoholism, even if passing out in the orchard is a lot less dangerous and dreadful than passing out on a city street. But still, a defiant love of the land and of a dying way of life. I never opened my books. Walked in the countryside until I was shattered, sat on the base of the war memorial in the little square watching my friends’ kids rush about and when they were tired sat them there beside me and told them stories in the quiet dusk. And I hung around in the cowshed until Pierre offered to show me how to milk the cows. My friends tittered, but I said yes. For once I brought no tension, no learner’s anxiety, sat down and did it, found the rhythm easily. Every day I got up early, drank strong, viscous black coffee and a shot of rough spirits (good grief) and milked one of the cows, while Pierre milked the other. A gap-toothed grin: Bon Dieu, she likes it - that’s a rare thing these days! You should marry a paysan! No irony, but genuine surprise and gratification. No irony on my side either. It was a good time, much needed, never forgotten.
" You made sure you had a little foam, and then you carried on milking, you just carried on milking. And then you let your thoughts wander. You thought about the new day, the weather, the birds. Your thoughts skipped from on thing to the other. What is happening to the world? Why do things turn out the way they do? " A seagull's cry: the wide, damp street outside flickers and becomes a wide, damp, biscuit-coloured beach. Wind in the trees: they quiver, quiver against the sky. So do I. Why does the arrow draw me, scurrying, late and in the rain? I think because it’s all too easy to feel trapped and enclosed, and anything that points - points to somewhere else. Piled, teetering and scattering across the road are all these huge chopped-off lengths of blue and yellow plastic piping, with a fallen outer circle of red plastic barriers - toys for the giants who come out to play in the city at night. Until a few years ago, despite having studied poetry in English, Latin, French and Spanish when young, and despite being a life-long voracious reader, I’d never really read poetry for pleasure. Then I found the Internet, found blogs and found the poets - along with the other writers, the artists, the photographers - in the blogging community and began to read their work, published one poem at a time, fresh from their minds or fished from old notebooks. Now I read poetry quite a lot and by no means mostly on line, and I think its place in my reading, in my life, will continue to grow. One of the poets I discovered on the Internet when I arrived here six or seven years ago was Rachel Barenblat, who blogs at Velveteen Rabbi, a wonderfully talented, committed, prolific poet of great sophistication, but always accessible. In the year following her son’s birth in 2009, every week Rachel blogged a new poem about her experience of motherhood. I read them voraciously, never less than awed, moved and enchanted by their emotional immediacy, formal skill and variety. The ‘mother poems' can be read, in reverse chronological order, here. What a collection this is – what a book it will be! But no need to wait for that. She has a new, full-length collection out now. 70 Faces: Torah Poems has just been published to coincide with her ordination as a Jewish Renewal rabbi. This is a hugely accomplished work that resounds with the cadences of ancient scripture, of historical English-language forms and of modern poetry with all its playing in and out of form. Written from the heart of faith and study, the poems reach out from a deeply informed and deeply felt specificity to the widest of audiences. Steeped in tradition and scholarship, she is in every moment a sophisticated and challenging writer, woman, mother and rabbi for today. Here are characters and landscapes of old, familiar stories from the books of Moses retold, repainted in startlingly vivid thoughts and images - the flood wreaked by a God with post-partum depression, the investigation and conjuring of the often absent woman's perspective, the rueful wondering how these stories might have been less harsh and vengeful, how their harshness might serve now as a lesson in compassion. And so the old stories come right into the texture of our own lives. I find here, in the lyrical re-telling and addressing of these new-old stories, a bitter-sweet, compassionate, entirely pertinent depiction of the continuing human compulsions to violence, competition, authoritarianism, lashing out and masochism - all those impulses that persist and horribly distort what might have been the blessings of prosperity and technology. each breath a new letter on the unrolling page. I love this book. It is sure to grip readers, from many religious traditions and none, who yearn, in these speeding, drifting times of ours, for a way into ancient and enduring songs and stories. 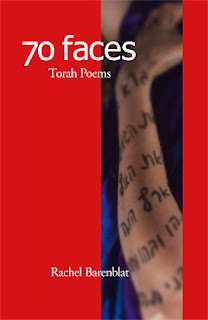 70 Faces: Torah Poems is published by Phoenicia Publishing of Montreal. Their website, where the book can be ordered, includes a preview of some of the poems and an audio recording of the poet reading. Two paperbacks nuzzle up to each other, perhaps uneasily, in my bag: How to become slightly happier and get a bit more done by Guardian columnist Oliver Burkeman and Melancholy, a novel by the Norwegian writer Jon Fosse. Disdained by those who use the study room and have a choice of seats, the old-fashioned, unmatching green armchair has been exiled today to the corridor for collection and disposal. Every time I look, it has an occupant – a traffic of passing, waiting, busy people glad of a seat and indifferent to style. Rub my face and eyes and mood against the waxy shine and perky flush of apples. Yank my focus free of panic and frustration, place instead on colours, touch and smell. These words on the page sing out, reach out to me, reach back to words on parchment, clay and stone. The soft ministrations of slimy shampoo and hot, streaming water are cleansing to mind and spirit as well as hair - all smooth and silky, just for a little while. As we cower damply at the crossing, the whole road turns to dark liquid flowing towards us - fallen rain racing over blocked drains and overflowing gutters. This first week back at work after the long Christmas holiday has been pretty relentless and tiring. Several times I've had the thought that I absolutely don't have the time or mental space or energy to stop and notice something outside my driven daily preoccupations, to compose even this tiny 'small stone' of words. But I keep finding that it doesn't eat up time or mental space; on the contrary, time stops and new space is created. If you have felt the same reservations, it's not too late to join the International Small Stones Writing Month. Along the corridor, at head height, floats a wavy line of doubled vowels. After all those grey-roofed days, the shock of air showering from a clear, high sky. Numb, reluctant body and numb, reluctant mind sit cubicled by heavy curtains of cold - the office has been closed and unheated for nearly two weeks. 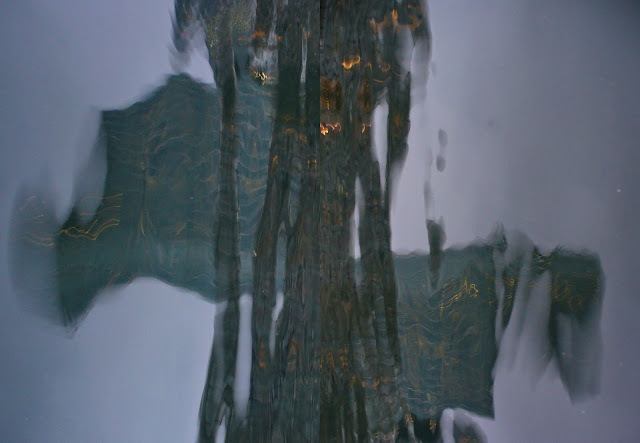 Midwinter dusk turns a tame urban pool mysterious - in the darkening shallow water, drops of light flicker among snaking, ghostly fragments of reflection. Soft, almost sour strawberry and bilberry icecream trickled over smooth, not-too-sweet chocolate pie - a dessert that satisfies all the senses, leaves no vague regret. - a layered, enclosing snail-shell of darkness. For the River of Stones.